Yeah you read that right, ADHD IS NOT A GIFT. There is so much misinformation out there. And many people are willing to make crazy statements so they can profit from it. Perhaps I feel this way because I have had to struggle, or maybe it’s because I talk to women every single day who are still struggling. If you actually have ADHD, and experience the everyday reality of it, how in the hell could you ever call it a gift? For those of us living it, ADHD still presents challenges to our success and sense of self. Without proper diagnosis and support, it is much more difficult to lead a productive, fulfilling life. So lets set the record straight as they say. Some like to say neurodevelopmental. Here is a link to the DSM that has all the details. I won’t go into that in this article. The cerebral cortex – which is the self-management portion of the brain. And the amygdala – which is the old “lizard” brain that plays a role in emotions and impulse control. In children and adults with ADHD these parts of the brain do not mature at the same rate and often remain underdeveloped throughout the lifetime. This is why so many of us do not grow out of ADHD. 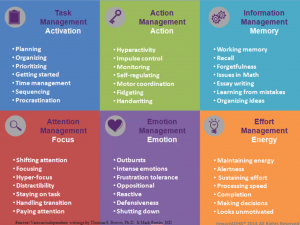 Because of the differences in our brains we have what are referred to as poor executive functions. Most people who are diagnosed with ADHD have issues with at least 3 of these categories. Let me give you examples of how I struggle with each of these executive functions. Activation– Planning, prioritizing and sequencing have always been an issue for me. Every time I sit down to plan a project I make myself crazy trying to put the steps into a logical sequence. Action – My handwriting is atrocious, always has been. I have very poor coordination and I fidget. Picture me in a meeting, I dare you. Memory – I cannot remember anything. Walking into a room and not remembering why happens at least twice a day. I cannot hold one thing in my mind while I work on something else. I failed algebra 2. Twice. Focus – Paying attention to the conversation is not a strong suit of mine. I rarely stay on task for any length of time. I get distracted by well…anything, and my attention is constantly shifting. Unless I am hyperfocusing, then I ignore everyone and everything. Emotion – Me reactive? NEVER! If I am upset, angry, embarrassed etc I cannot focus on anything else. I perseverate on other people’s tone of voice, and often think they are upset with me. Also, I tend to just shut down emotionally and refuse to talk. Energy – I am not, and never have been hyperactive. In fact, I am underaroused and have trouble sustaining mental effort because I get mentally tired. My thinking is fast but the depth of my thoughts is shallow. p.s. I did really well on stimulants because I was more aroused. I struggle in every single area of executive function. Even when I hyperfocus, it is hard to see this as a gift. For more medically-accurate information search Dr. Russell Barkley. Every ADHDer I have spoken with, whether diagnosed as an adult or child, can confirm that we always feel a little different. From a young age, we can feel that we are different from other kids. I remember deciding in first grade that in order to have friends, and for my parents to like me, I would have to become someone else. So I asked my best friend at the time how to be her. She had no idea what I was talking about. But even at age 6 I sensed that there was this part of me that was not going to be acceptable to some people. As we age, we make impulsive decisions trying to fit in with what we think** we should be. Living in a culture where image is so important, ADHDers are under an enormous amount of pressure to conform. To look the part. Some of us develop crippling anxiety and shame that prevents us from maintaining relationships. Others become dangerously impulsive and make bad decisions. Only recently have we begun to understand the emotional aspects of living with ADHD. Experiencing rejection, criticism, and shame at a young age can really damage a kid. My dad left me when I was very young. His new family was very demanding of his time and attention. So he made a decision to put his new wife and her needs ahead of mine. To a kid, that was a rejection. Rejection from a parent is made even worse when the other parent is not stable either. Because I was focused on fitting in, I was able to compartmentalize the bad stuff. Pushing everything down was admittedly a protective mechanism. This sort of self-made resilience or mental toughness is the closest thing to a “gift” I can think of. But not every story ends like mine. Many people with undiagnosed and treated ADHD never live up to their potential. It is estimated that 40% of the prison population in this country could be living with adult ADHD. One of my favorite things in this world is offering my time and energy to supporting other women who are wading through the emotional muck of life. I remember when I was teaching 9th grade English, people seemed to think that I would have great ideas about teaching Romeo and Juliet. I think a lot. But rarely do I have wonderful out-of-the-box ideas. I like to know the parameters of what is expected of me. And if possible I want very specific directions. Ambiguity doesn’t sit well with me. The whole out-of-the-box thinker gift was not bestowed upon me. I do have this website, and my client services. But I am hardly an entrepreneur. You see, I spend so much time overthinking every single decision that I become frozen. The fear of yet another failure in my life is totally paralyzing. Or a superpower. Or some kind of special entrepreneurial mindset. The diagnosis means that you think differently, and your brain is wired differently. ADHD is not a brain disease, and you cannot catch it. But it is highly heritable. My son has ADHD and High Functioning Autism. Some in the medical community think the two conditions are genetically linked somehow. Who knows? People are gifted because every human being on Earth has some gift. Ultra-successful people like Richard Branson are successful because they have support. Support comes in many forms: great parents, great life partners, coaches, therapists, and GASP medication! I would probably be a more successful business person if I outsourced some of the day-to-day crap that weighs me down. If you have the resources to do so you can outsource many things. Cleaning, organizing, cooking, scheduling, finances. I wholeheartedly believe in outsourcing the stuff you are not good at. But that is not an option if you are barely making your rent/mortgage payment every month because you cannot hold down a job. But ADHD is also not a curse! It is a workable lifestyle. ADHD is a difference in cognition. A difference in the way we look at the world. We feel things more intensely. This includes the good as well as the bad! You are not ADHD – ADHD is a part of who you are. Don’t use ADHD as an excuse. Just practice self-acceptance and reach out for the support you need. As Jessica McCabe said in her Ted Talk – Welcome to the Tribe! Join my semi-regular email list. I try to remember to send emails every week.